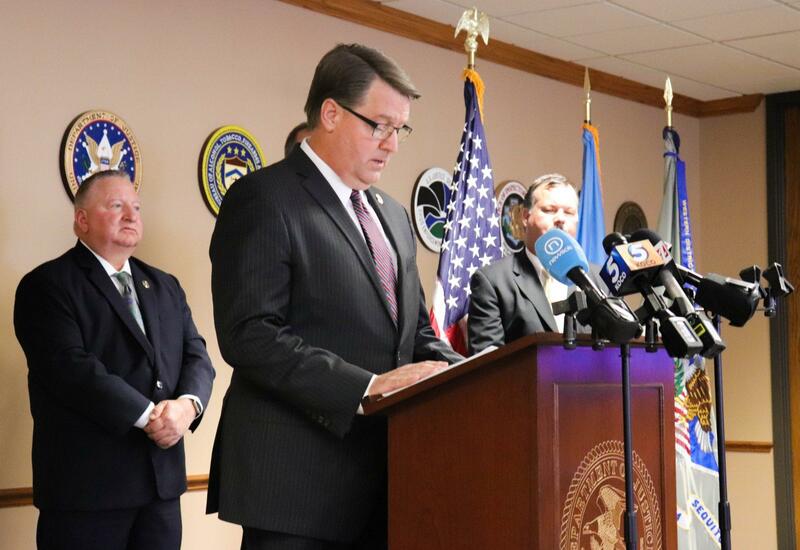 Acting U.S. Attorney Bob Troester announced indictments against the five Oklahomans, Thursday. The U.S. Attorney’s Office of the Western District of Oklahoma announced indictments Thursday against three Oklahoma doctors, a pharmacist and a businesswoman on more than 200 counts of federal charges for health care fraud and writing illegal prescriptions. Two of the doctors face charges for five deaths that prosecutors claim resulted from their alleged illegal distribution of drugs. The Oklahomans are five of 601 people the U.S. Department of Justice announced it had taken actions against in a nationwide crackdown on similar crimes, Thursday. Doctors Melvin Lee Robison and Moheb Hallaba of Sayre were charged for the overdose deaths of five of their patients. Federal prosecutors also indicted the doctors for conspiracy and about 50 counts of illegally distributing prescription drugs. Robison was also indicted for more than 100 counts of fraudulent Medicare billing. Acting U.S. Attorney Bob Troester accused the doctors of “filling hundreds of prescriptions per week without reviewing patient files or even seeing the patients” for nearly two years. He said Robison wrote prescriptions after an investigation into his practice led the state Board of Osteopathic Examiners to take away his permission to approve prescriptions. Federal prosecutors accused the doctors of giving patients prescriptions for opioids like oxycodone, oxycontin, hydrocodone, morphine and fentanyl, alongside prescriptions for benzodiazepines like valium and Xanax. Both doctors face up to 20 years for each count of illegal distribution of drugs, and potential life sentences for charges in the overdose deaths. Robison also faces up to 10 years for each count of Medicare fraud. In a separate case, Dr. James Ferris and his employer, Sherry Isbell — owner of the Wellston business Physicians at Home — are accused of running a Medicare fraud ring with pharmacist Katherine Dossey for at least three months in 2015. Federal prosecutors accuse Isbell of sharing patient information with Dossey who used it to fill out blank prescription forms that had already been signed by Ferris. Together, they were charged with dozens of counts of illegally distributing drugs and Medicare fraud. They face up to 20 years in prison for each count of drug distribution and up to 10 years for each count of Medicare fraud. Attorneys for Ferris and Dossey declined to comment. Isbell, Hallaba and Robison and their counsel could not be reached for comment.